Breast cancer can occur without any warning signs. Making the right diagnosis is essential to creating the right treatment plan. Your treatment plan will be designed just for you. Your follow-up care will continue after your treatment ends. You are unique, and your breast cancer is also unique. The treatment plan recommended by your team of specialists is designed to achieve the best outcome possible for your breast cancer. The usual sequence of treatment for early-stage breast cancer is first to undergo surgery to remove the tumor in the breast and to perform sentinel node staging. If additional chemotherapy is needed, it usually follows the surgery. When radiation also is needed, it usually is given after chemotherapy. The treatment of early-stage breast cancer is aimed at preventing the cancer from ever coming back – the goal is cure. Treatment nearly always includes surgery to remove the tumor in the breast. It also may include radiation therapy and medical therapy (either chemotherapy or “anti-estrogen” therapy). Most of the time, treating the tumor in the breast does NOT require a disfiguring mastectomy. This approach is called “breast conservation” and includes a “lumpectomy” and radiation therapy to treat the rest of the breast. If mastectomy is the right treatment for you, then you also will be recommended to see a plastic surgeon to discuss breast reconstruction. Lori Alfonse, DO, is a fellowship-trained breast surgeon who is part of a team dedicated to helping you make the best treatment decisions possible. Born and raised in the Lehigh Valley, she believes in treating the person, not just the disease. With a breast reconstruction approach called oncoplasty, the surgical oncologist (cancer specialist) and plastic surgeon work together right from the start. They consider the extent of cancer surgery needed, the patient’s breast size and shape, and potential reconstruction techniques so the breasts will match. The result is an artful blend of plastic surgery and complete cancer removal. Evaluating the lymph nodes under the arm on the side of your breast cancer is important to determine both prognosis and additional treatment. Removing all the lymph nodes (axillary dissection) is rarely needed. Sentinel lymph node biopsy has replaced axillary dissection for most patients. It is a surgical procedure to determine if cancer cells have spread to the lymph nodes and usually is performed at the time the tumor in the breast is removed. 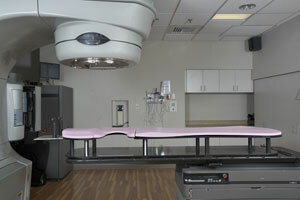 Radiation therapy usually is recommended for women undergoing breast conservation. It is needed to treat the rest of the breast to reduce the risk that the cancer will come back in the breast. Most often the radiation therapy that is used is called whole breast radiation, meaning that the whole breast, and sometimes nearby lymph nodes, are treated with radiation. In most cases, this takes about seven weeks of Monday-through-Friday treatments. Some early-stage breast cancers may be amenable to a shorter course of radiation aimed at the lumpectomy site only. This is called accelerated partial breast irradiation (APBI). Accelerated partial breast irradiation treats only the lumpectomy site, usually through a catheter placed by the surgeon into the lumpectomy cavity. A radioactive source then is placed into the catheter. If you are a candidate for APBI, your radiation oncologist will explain the pros and cons about the procedure. Radiation therapy is a common treatment course for breast cancer, and often is used for women with early-stage cancer who opt for breast-conserving therapy. For some women, especially those with larger breasts, lying in a prone, chest-down position for radiation therapy may reduce the risk for certain side effects from the treatment. With prone breast irradiation therapy – now offered at Lehigh Valley Health Network – a patient lays chest-down on a special table that allows one breast to fall downward for treatment. This is an alternative position to the more traditional supine position, where a patient lies on her back for treatment. By allowing the treated breast to fall away from the body, a skinfold between the breast and the torso is eliminated, helping reduce the risk of radiation dermatitis. This is a temporary irritation of the skin from radiation, but it can be more severe in women with larger more pendulous breasts who are treated in the traditional supine position. In addition, prone positioning also improves the angle for radiation targeting. Recent studies find prone breast irradiation reduces incidental radiation exposure to the lungs, as well as limits the small risk or radiation exposure to the heart when treatment is focused on the left side of the torso. Your radiation oncologist will discuss prone breast irradiation if you are a candidate for its use. To learn more about breast cancer care, call 610-402-CARE to find a surgeon. Accelerated partial breast irradiation radiates only the lumpectomy site. About a week after the lumpectomy, the surgeon inserts a catheter (thin tube) through the breast to the lumpectomy site. The catheter’s position is checked two days later by CT scan, and then a radiation seed is implanted. The seed remains in place for 6-10 minutes, and then is removed. Six hours later, the procedure is repeated. APBI is not for everyone. To be eligible, a breast cancer patient should be over age 50, have a low-risk cancer that is not too big (less than 2 centimeters) with enough cancer-free breast tissue around the tumor site, and no evidence of cancer in the lymph nodes. In addition, APBI may be particularly helpful for patients who can’t get to the hospital for treatment every weekday for six weeks – for example, those who live far away. Breast cancer isn't a single disease. Your treatment team will customize your treatment plan based on several factors. The "stage" of the tumor is determined by its size, involvement of nearby lymph nodes or the presence of cancer cells elsewhere in the body. Sensitivity to estrogen and to anti-estrogen (“hormonal”) treatments depends on the presence of estrogen receptors on the cancer cell. When estrogen and/or progesterone receptors are present, hormonal therapy is part of your treatment. Examples of hormonal therapy include tamoxifen and aromatase inhibitors. Your medical oncologist will recommend the right hormonal therapy for you. When a certain cancer-stimulating protein is present on the breast cancer cell, it is present because the human epidermal growth factor receptor 2 (HER2) gene has been “turned on” and is instructing the cell to make HER2 neu protein. This protein sits on the cell surface and acts as a switch to stimulate growth of the cancer. Treatment directed at “neutralizing” the effect of this protein uses either an antibody (for example, Herceptin) or a small molecule that interferes with its function and turns the HER2 growth switch off. Chemotherapy is recommended when either the stage of the cancer or its biology predicts a high risk of recurrence. Chemotherapy uses drugs that have been developed specifically to treat breast cancer and have been proven to reduce the risk for recurrence. In breast cancers that are sensitive to estrogen (estrogen receptor and/or progesterone receptor positive), the goal of hormonal therapy is to stop the cancer cells from growing. Several types of hormonal treatments have been developed to treat estrogen-sensitive breast cancers in women of different ages and different menopausal status. Tamoxifen belongs to a class of drugs called selective estrogen receptor modulators (SERMs). It acts mostly as an “anti-estrogen” on breast cells, inhibiting them from growing when stimulated by estrogen. It can be used in both premenopausal and postmenopausal women. It has other estrogen receptor actions that cause side effects and are associated with certain risks such as blood clots and uterine cancer. Aromatase inhibitors (AIs) are used only in postmenopausal women, including young women whose ovaries have been removed or medically “turned off.” AIs prevent the production of estrogen by inhibiting the enzyme aromatase, which makes estrogen in postmenopausal women. When there is no estrogen, then the estrogen receptor can’t be turned on to stimulate cancer growth. Other drugs inactivate the estrogen receptor through different mechanisms. Your medical oncologist will recommend the hormone therapy that is best for you. Herceptin is an antibody used in combination with chemotherapy for breast cancer treatment. Only about 25 percent of breast cancer patients are eligible for Herceptin therapy. These women have tumors with too much of a cell protein called human epidermal growth factor receptor 2 (HER2). HER2 plays an important role in turning a normal cell into a cancer cell. HER2 also is associated with a more aggressive cancer and higher risk for breast cancer recurrence. The test for HER2 is done at initial diagnosis and at the same time that tests are done for estrogen and progesterone receptors. Only women who test positive for HER2 can receive Herceptin. Additional drugs are being developed to target the HER2 receptor complex on the breast cancer cell surface. Your medical oncologist will recommend the best type of HER2-targeted therapy for you. Clinical studies have shown that patients who are HER2 positive and who also receive Herceptin have a significant decrease in breast cancer recurrence compared to patients who receive chemotherapy alone. Chemotherapy is the use of anticancer drugs to treat cancerous cells. Chemotherapy has been used for many years and is one of the most common treatments for cancer. In most cases, chemotherapy works by interfering with the cancer cells' ability to grow or reproduce. Different groups of drugs work in different ways to fight cancer cells. Chemotherapy may be used alone for some types of cancer or in combination with other treatments such as radiation or surgery. Often, a combination of chemotherapy drugs is used to fight a specific cancer. Certain chemotherapy drugs may be given in a specific order depending on the type of cancer they are being used to treat. While chemotherapy can be quite effective in treating certain cancers, chemotherapy drugs reach all parts of the body, not just the cancer cells. Because of this, there can be many side effects during treatment. Being able to anticipate these side effects can help you and your caregivers prepare and in some cases prevent these symptoms from occurring. Although the usual sequence of treatment for early-stage breast cancer is first surgery to remove the tumor in the breast and to perform sentinel node staging, followed by appropriate systemic therapy and radiation therapy, certain circumstances determine different approaches. For example, patients with breast cancers that do not have estrogen or progesterone receptors, and do not express HER2 protein on the cell surface (“triple negative”) often receive chemotherapy first to reduce the size of the breast tumor, and in some cases eradicate the tumor from the breast, before undergoing breast surgery. Preoperative (or neoadjuvant) treatment often is recommended also for patients whose tumors express the HER2 protein and for some advanced-stage breast cancers. Breast cancers that are estrogen and progesterone receptor positive and do not express HER2 proteins generally do not undergo neoadjuvant treatment unless the goal is to reduce the size of the breast tumor to permit breast conservation. Working together, your treatment team will recommend neoadjuvant chemotherapy for you when it is appropriate. Depending on your unique situation, you may be a candidate for a clinical trial designed to evaluate new treatment approaches for early-stage breast cancer. Clinical trials are medical research studies that enlist volunteers to learn whether new medications, practices or devices are safe and effective. They are designed to find better ways to prevent or treat disease. The Cancer Centers at Lehigh Valley Health Network partner with the National Cancer Institute to provide access to clinical trials in breast cancer that may lead to improved treatments in the future. Your physician will work with a member of your multidisciplinary team, the clinical trials research nurse, to determine if you are eligible to participate in one of the breast cancer research trials open at Lehigh Valley Health Network. Cancers are capable of spreading through the body by two mechanisms: invasion and metastasis. Invasion refers to the direct migration and penetration by cancer cells into neighboring tissues. Metastasis refers to the ability of cancer cells to penetrate into lymphatic and blood vessels, circulate through the bloodstream and then invade normal tissues elsewhere in the body. If you have metastatic cancer, you want the care that will give you the best chance for recovery. At Lehigh Valley Health Network, you’ll benefit from our active involvement in research to find new treatments that extend life. The term “metastases” refers to cancer cells that have spread from the site (organ) of origin to other sites (organs) in the body. The process is called metastasis, and occurs most often when cancer cells from the “primary” tumor invade into surrounding tissue and enter either or both the lymphatic and blood vessels. An example of “metastatic” cancer is when a cancer that starts in the lung, or breast, or colon spreads to the liver. The cancer growth in the liver, then, is called metastatic lung, or metastatic breast, or metastatic colon cancer, depending on where the primary tumor started. The term metastatic is generally applied to cancers that have spread from “solid” organs — such as lung, breast, colon, pancreas, prostate, uterus or ovary. Sometimes when a new tumor or lesion is suspected to be a metastasis from a cancer that has been treated in the past, a repeat biopsy is recommended to confirm that the abnormality is, indeed, the same cancer and also to re-test the cancer for biologic or genetic characteristics that will help determine the type of treatment. The extent that a cancer has either remained localized or spread is characterized by its “stage.” Localized cancers (for example, cancers confined to the organ or origin) are described as early-stage cancers, and cancers that have spread to distant sites (or organs) are described as metastatic or advanced-stage cancer. The treatment of metastatic cancer is specific to the type of cancer that has spread. Thus, the treatment of metastatic breast cancer (cancer that has spread beyond the breast, for example, to the bone or lung) still is treated as breast cancer. Treatments for metastatic cancer include all the same strategies that are used in the treatment of early-stage cancer — chemotherapy, biologic therapy, targeted therapy, surgery and radiation. The goal of treatment in metastatic disease is usually not to cure, but to control the disease as long as possible, using all treatments available while maintaining or improving the quality of life, and while not doing more harm than good.